Links to your IDX pages are found in your IDX control panel under Design -> Website -> Page Templates. Here, you will find a list of all of the IDX pages available for you to add to your website. 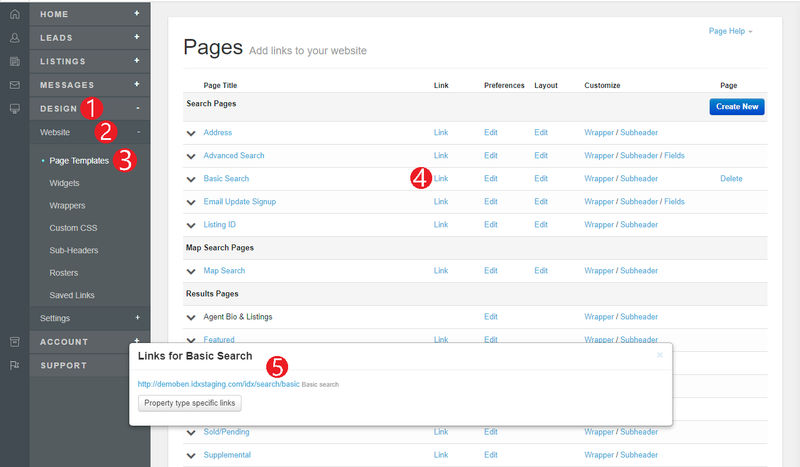 These pages include Search Pages, Listing Pages, Contact Pages, and Lead Signup and Login pages. To add a page to your website, the best method is to simply copy the URL for the page you would like to add from the Control Panel, and paste it into your website navigation as a link. You can easily get the URL for any of your IDX pages by clicking on Link under the Link column.